Large oversized orders as well as ALL ARF MODELS are EXCLUDED from this offer. This promotion is valid for single orders only. Multiple orders can not be combined to become eligible for the free shipping. The customer is responsible for selecting the free shipping option. If your order total is not over $100.00 (before shipping) and you or system selects the free shipping, you WILL BE CHARGED for shipping before the order ships. This offer is not retroactive; once the order has been placed we cannot change the shipping. This is a limited time offer. We may stop this promotion at any time. We will do our best to ship all domestic orders received before 1PM the same day. While we make every attempt to maintain an accurate inventory, sometimes we experience a system error or an unexpected delay from our manufacturers. If such a problem occurs we will make every reasonable attempt to inform you. Please use the handy Shipping Calculator on our website. Just enter your US Zip code, and the system will return the shipping options for the items currently in your shopping cart. For international rates, and how to calculate them, please see the international section below. When you place an item in your Shopping Cart, the Shipping Calculator will appear in the menu bar on left-hand side of the page. Simply enter your zip code and your shipping options and prices will be shown. (Large sailplanes, large ARF/ARC models).....Please call for us for shipping charges on larger items. 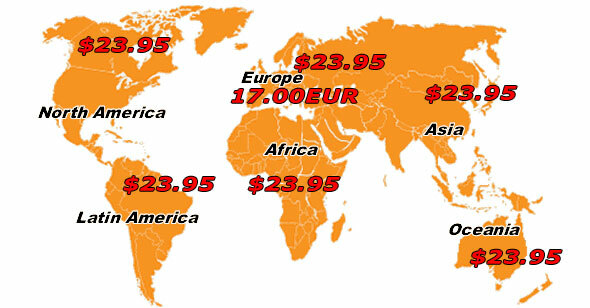 To calculate shipping cost, the system needs information on where you live. If you would like the shipping costs for your order, just add the items you would like to the shopping cart, and proceed to our checkout (If you have shopped with us before you can log in, or you can select right away the Checkout Button). On the next page, enter your shipping and billing addresses, as accurately as possible, then click next. At the top of the following page, you will see your available shipping options. USPS rates are the default shipping method. If applicable, there may be a button to view the rates from the FedEx and Custom/Free Shipping options. Most countries in 1-6 weeks (No Tracking, No Insurance, No Replacement Guaranteed). Most countries in 21-28 business days (No Tracking, No Insurance, No Replacement Guaranteed). Most countries in 6-12 business days (No Tracking beyond your Customs). Replacement guaranteed only up to customs invoice value. For most Special Order items, please allow 2-6 weeks for delivery. Please first check with your local Post Office or Customs service as sometimes they are responsible for delayed delivery.